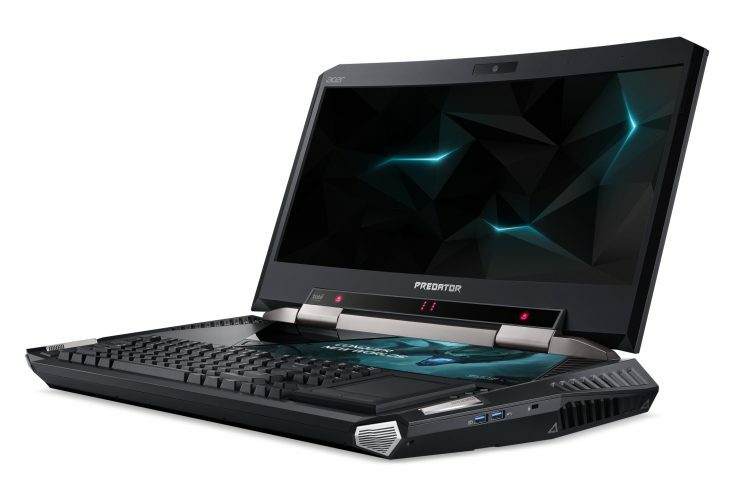 Acer launched Acer Predator 21 X Gaming Laptop at Consumer Electronics Show CES. Its components are excessive and it is the first ever such machine with a curved display. The Predator is a monster in terms of both size and cost. In also includes a mechanical keyboard and it comes with an i7-7820HK processor and two GTX 1080 card running in SLI configuration and Tobii eye tracking, so people can watch what your eyes do while you play DOTA 2. Going along with that, it has 64 GB of DDR-2400 memory, a 1 TB 7200 RPM hard drive, and as many as four 512 GB solid state drives. Acer includes Killer DoubleShot Pro to automatically pick the fastest network connection (Ethernet or wireless) and it will send all high priority traffic over that interface while standard traffic is sent over the other. The Thunderbolt 3 compatible USB Type-C port also delivers speeds up to 40 Gbps. The Predator 21 X also includes AcerDustDefender, which removes dust build-up, and Acer’s CoolBoost app, that can be used to adjust the fan’s airflow to deliver extra cooling performance during heavy use. Its metal maintenance panel provides access to the RAM modules and one 2.5 inch hard drive. There are also four speakers and two subwoofers, for outside sound performance. The Predator 21 X costs $8,999. Or, more precisely, prices start at $8,999 and go up from there, depending upon the particular options. In EMEA regions, prices start at 9,999 Euros. It will be available starting in February.